The main attraction on Siesta Key and the island’s claim to fame is its 40-acre crystal beach, which was verified by Harvard University’s geology department as being 99 percent pure quartz. It is consistently rated one of the top 10 beaches in the United States and the world, with beautiful pure white sand that is finer than most refined sugar and packed hard at the water’s edge, making it ideal for walking, bike riding, and other exercise. 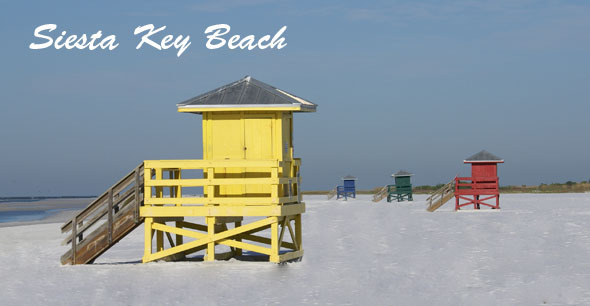 Its legacy includes being named “The Whitest and Finest Sand in the World” by The Great International Beach Challenge in 1987, “The Best Sand Beach in America” by The Travel Channel in 2004 and, most recently, Dr. Beach ranked Siesta Key No. 2 on his list of “America’s Best Beaches” in 2009. Quartz also is cool to the touch, making the beach easy on bare feet, even in during the scorching days of August and September! 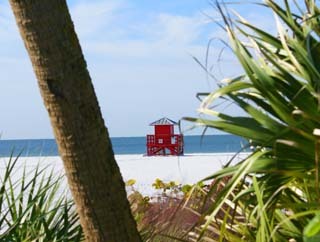 Siesta Beach spans from Siesta Village at the heart of the island to Point of Rocks, a shallow formation of limestone that extends into the Gulf of Mexico at the middle of the western shore of the island. There are two primary public accesses to this crystal stretch of shoreline. 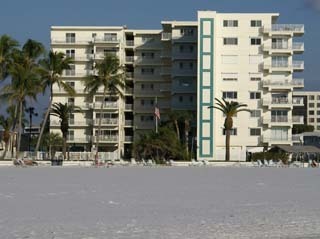 The first is at the Siesta Key Public Beach, which has a free 800-spot parking lot and amenities including restrooms, concession stands, picnic areas/shelters, free lighted tennis courts, playground equipment, and year-round lifeguards. In addition to the main parking area, there also are numbered public beach accesses with limited parking heading north into the Village. The second primary public access is Crescent Beach, which has limited parking but usually is less crowded. It stretches for about 1.5 miles and ends at Point of Rocks, which has a unique underwater formation of coral rock and caves that offers an excellent underwater environment for snorkeling and scuba diving. There also is legend that Point of Rocks was a favorite spot for pirates looking to bury treasure! Travel to the southern tip of the island, and you will find Turtle Beach, which borders a small lagoon surrounded by mangroves. The beach itself has been refurbished in the past few years, which has changed the texture of the sand, making it coarse. However, it is a quiet beach great for picnics, shelling, and searching for prehistoric petrified shark teeth. And while there are no lifeguards on duty at Turtle Beach, the area has free parking, picnic areas, a playground, showers, restrooms, and a boat launch with trailer parking. Additionally, the lagoon, called Blind Pass, connects to Little Sarasota Bay, and it is an excellent spot for kayaking and fishing. Turtle Beach also joins with Palmer Point Beach, a popular spot for boaters to anchor and the original home of Mote Marine Laboratory, which now is located on City Island, just north of St. Armands Circle.